Many students arrive at our schools feeling frustrated, overwhelmed and uninterested because they have not experienced success before,” says Wendy Greenfield, Vice President of Development for Hope Christian Schools. “Our job is to get them excited about school again and to see that they can be successful.” She claims there is no magic formula to academic success. And yet walking the halls and visiting the classrooms on a recent tour of Hope High School at 3215 N. MLK Drive, I felt the magic everywhere. “A big foundation for us is creating an atmosphere of love and happiness,” says Hope Principal/Superintendent Kole Knueppel. “The kids feel that right away. They sense that this place is different. They feel and know that the people here love them and will do anything to help them. And that changes the dynamic quite a bit.” Knueppel thinks people who talk negatively about today’s youth hold misconceptions about them. He sees a lot of positive energy in young people, “and once you tap into it, the kids respond,” he adds. “You know they really want a lot of the things that we espouse in terms of being successful – doing the right thing, being responsible for behavior, going to college – the kids have those dreams.” What does it take to move students from frustration, disinterest and a general dislike for school to high school diplomas and college acceptance? “It takes a lot of work on the parts of the students, the teachers, and the families,” says Greenfield. “Our philosophy is that every child can and will learn. The teachers really take great care to help them understand that school can be enjoyable, and that they can achieve academic success.” Hope Christian Schools opened their first school in 2002 at 2345 N. 25th St. and welcomed 49 elementary students in grades K-4. 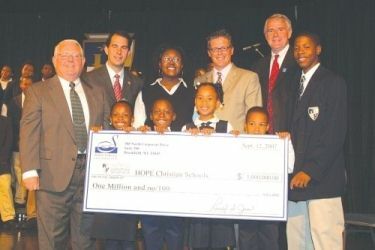 Two years later the Hope High School opened its doors, and in 2005 Hope Middle School opened in Riverwest at 510 E. Burleigh. Affiliated with the Lutheran Church, all three schools are part of the Milwaukee Parental Choice Program. Today they draw over 500 students from a wide variety of Milwaukee neighborhoods including a large percentage from Harambee and Riverwest. All three schools use traditional teaching methods. Every day all students get 90 minutes each of math and language arts. Half of that time is focused on learning at their particular grade level; the rest of the time is spent learning at the level they’re actually at. “For example, if a student is in fifth grade but actually doing second grade math, they’ll be able to work [during that] time on getting caught up to where they need to be,” says Greenfield. “The kids really enjoy it because they see success on a daily basis as they’re constantly progressing up.” The schools do not track their students. “We believe in keeping the kids together as much as possible,” says Knueppel. “We work to catch the kids up who are behind and give the kids who are at or above grade level the time to work independently and move even further ahead.” Saturday School is another way Hope helps their students succeed. Optional for most students, the program allows them “to come in for a couple of hours to work on their homework and get assistance if they need it,” explains Greenfield. They also have the opportunity to spend free time with their teachers playing basketball, chess, or other activities that build relationships on a one-toone basis. “Our faculty considers our students an extended part of their own family,” says Greenfield. “They’re very dedicated. All of the students have their teachers’ and administrators’ phone numbers so if they’ve got a problem or a challenge, they can call them and find a solution.” All students are expected to come to school in uniform, on time, with their homework done. If they get stuck on a math problem, for example, they are to use that teacher’s phone number and call for help. “We want all of our students to focus on being solution finders,” says Greenfield. Family involvement is an expectation at Hope. “In order for the students to succeed, it’s important for the families to be engaged. If everybody is invested, the children can do great things,” says Greenfield. The schools provide families with academic report cards every two weeks “so they know exactly what the students are doing.” In addition, quarterly parent/teacher conferences yield high turnouts at all three schools, more than 95% at the elementary level. A variety of volunteer activities provide families further opportunities to stay involved in their children’s education. During summer break, students from fifth grade and up may partake in Hope’s Summer of a Lifetime Program designed to extend their learning and character development. The students experience a variety of activities outside the classroom, such as fine dining in restaurants like Lake Park Bistro, visits to the Milwaukee Art Museum, camping, or a day at Six Flags. Next time you feel maxed out on bad news and starved for a good feeling about the future of today’s youth, call for a tour at one of the Hope Schools. And if you’re passionate about urban education and want to support it with some of your dollars, contact Wendy Greenfield about contributing to Hope’s building campaign. Their growing enrollment needs a new middle school.